Scorning those “helicopter parents” who hover over a child’s every task, many fathers have migrated to a more hands-off approach in recent years. Practiced in moderation, this long-distance oversight is sometimes called “consequences parenting” for its intent of purposely allowing kids to fail when they make mistakes. If a kid forgets to pack their cleats, they’ll simply have to skip soccer practice. But taken to an extreme, the philosophy has been branded “free-range parenting,” and even sparked a lawsuit in Maryland when one family allowed their 6-year-old and 10-year-old to walk a mile home alone from a visit to the local park. Maryland law requires children younger than 8 to be supervised by a reliable person at least 13 years old when they are left in homes or cars, but the law says nothing about outdoors activity. Supporters say they are just trying to raise capable, self-reliant adults who can grow up to get a job and afford to pay their own rent or mortgage. That defense makes sense when viewed through the lens of complaints about the rising tide of “boomerang children” who return to live in their childhood bedrooms after college graduation. Other dads push back by citing fears that the dangers of the modern world have changed the conversation. Childhood freedoms that were seen as normal a generation ago – sleeping overnight in a backyard tent, or wandering between different neighborhood homes until dinnertime – might be classed as neglect today. Allow your 9-year old to ride a big-city subway alone? 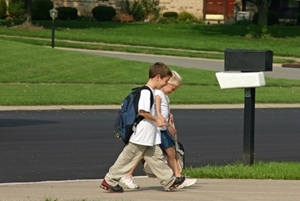 Let your 6-year-old walk a mile home from the park overseen only by her 10-year-old brother? Ask your 9-year-old son to walk home from school on his own?